Size 18" stretches to 25"
Size 16" stretches to 20"
Size 14" stretches to 16"
The ForceField FFTM Headband is lightweight, ventilated and adjustable with an impact absorbing polymeric layer that wraps around the head, offering increased protection at crucial impact zones where many head impacts occur. It's all part of our patented design combining advanced technology without taking away any of the techniques involved in playing the sport of soccer. Because of the design of the headband, the ball always plays true as if it were coming directly from your head. Moreover, the ForceField FFTM Headband is in compliance with FIFA Law 4, so it's not just in keeping with the spirit of the game, but also the rules. The product absorbs perspiration. If one side gets wet, you turn it inside out and use the other side. On real hot days, it can be placed under cold water and put on for cooling as well. It is easily washed by just placing the headband under a running faucet. Two United States patents have been approved, and there are others pending. The headband significantly reduces the severity of the impact forces. 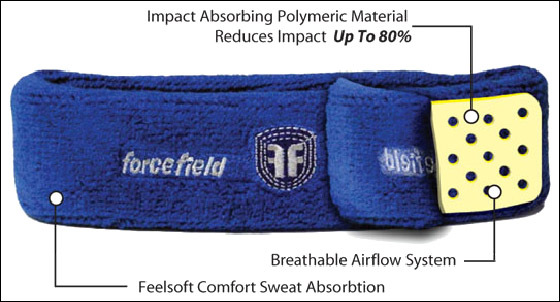 The headband absorbs and dissipates perspiration. It is washable. You can dip it in ice water and wear to cool you off in the hot weather. The only protective headband designed for the sport of basketball. Protective headband for children's recreational play.